Staying on top of your six month checkups and cleanings with the dentist in Coplay is a big part of good dental hygiene. But it’s not the only thing. What about the time in between those twice-annual visits? That’s (hopefully not more than) six months — and just enough time for cavities and infection to begin. Follow these tips to maintain good dental and oral health all year long! You should change your toothbrush at least every three to four months, or as soon as you notice its bristles starting to wear or flatten. That means if you’re visiting the dentist as recommended, you should upgrade to a different brush at least one time between appointments. Of course, you should also change toothbrushes after you’ve been sick (hello flu season) to avoid spreading germs. Water isn’t just good for your skin and hair. It’s also a vital part of a healthy mouth. That’s because a well-hydrated mouth has plenty of saliva, the fluid that naturally washes away the acids and bacteria that cause tooth decay and gum disease. Drinking plenty of water throughout the day improves your oral health and also freshens your breath. So the next time you hit your midday slump, reach for that reusable water bottle instead of the coffee pot. You just may notice your teeth start to look a little brighter, too. Can’t seem to reach the two minute mark every time you brush? Cleaning for the full amount of time is the only way to make sure you are really removing the plaque and bacteria buildup that lead to more serious dental issues. If you have difficulty brushing for two minutes, twice a day, you could invest in an electric toothbrush that comes with a built-in timer. Or you could try adding some exercises to your brushing routine! Do a few sets of squats, or try balancing on each leg for 30 seconds to a minute at a time. Maintaining good nutrition is vitally important for your oral health. We know it’s not easy to overhaul your diet, though. So here’s something easy you can do to get a few extra vitamins for healthier teeth and gums — switch out your mid-morning snack for a handful of almonds. Aside from giving a good dose of calcium, the mineral that strengthens the tooth enamel, almonds also naturally scrub away plaque and other germs from the teeth. And it doesn’t hurt that they’re tasty, too! FLOSS! We know there were some articles bouncing around earlier in the year proclaiming the end of flossing, but, sorry to say it, those were bogus. Flossing is a crucial part of good dental hygiene — it’s the only way to remove the food particles and bacteria your toothbrush leaves behind. 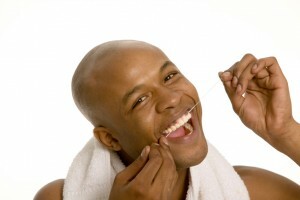 Place the dental floss somewhere you’re sure to see it in the evening to encourage the habit. Questions regarding your dental health? Or maybe it’s time to schedule a checkup and cleaning. We invite you to request an appointment with the Coplay dentist, Dr. Salivonchik today!